At first! If you use free STB plugin, deactivate it before installing STB Pro. These plugins are not conflicting at run time but they are using the same shortcodes. The using of the common shortcodes by both plugins at the same time can lead to unpredictable consequences on Front Side! If plugin’s menu is appeared in main admin menu, STB Pro plugin was installed successfully. If the buttons “Save Current Theme As…”, “Upload New Theme” and “More Themes…” are not available, then something went wrong. 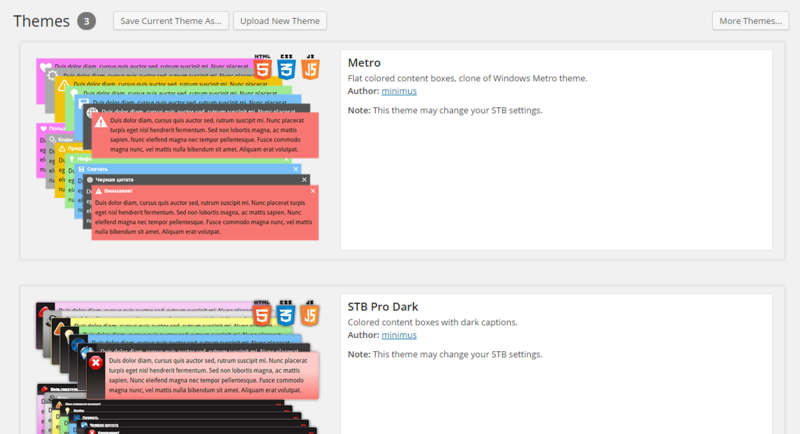 If buttons on the Themes Page are not available, it means that plugin’s themes folder was not created and you can use only the built-in plugin themes. Why it happened? Probably plugin did not have access rights to create a folder. How to resolve this problem? Create folder manually! For manually creating themes folder use FTP-client or File Manager of ISPManager (Plesk, etc.). Create folder “stb-pro-themes” in the “wp-content” folder and set it access rights to 755 or 777. Re-visit the plugin themes management page and make sure that the buttons are appeared (as on Fig. 1). If so, you have access to all functions of the themes management of plugin. Thats all.